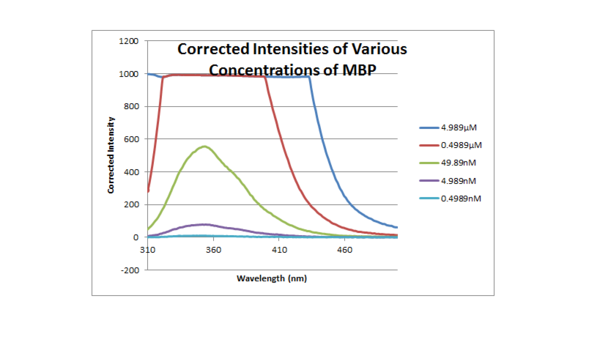 Take fluorescence spectra of the maltose-binding protein (MBP). First, the 10.714μM MBP was diluted by mixing 1397μL of it with 1603μL of 50mM Tris buffer, pH 7.55. This gave a final concentration of 4.989μM. The intensities of this was taken from 310nm-500nm when excited at 290nm. Then, 300μL of the 4.989μM MBP was diluted with 2700μL of the same Tris buffer for a final concentration of 0.4989μM. 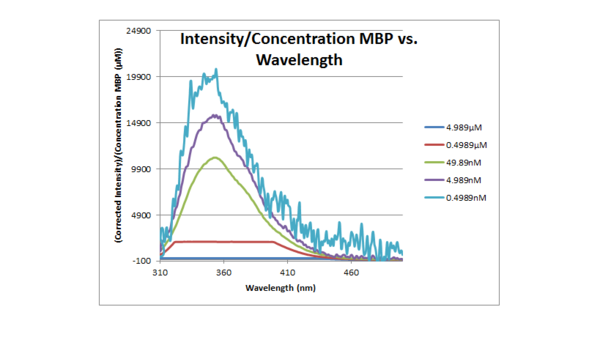 Then, 300μL of the 0.4989μM MBP was diluted with 2700μL of the same Tris buffer for a final concentration of 49.89nM. Then, 300μL of the 49.89nM MBP was diluted with 2700μL of the same Tris buffer for a final concentration of 4.989nM. Then, 300μL of the 4.989nM MBP was diluted with 2700μL of the same Tris buffer for a final concentration of 0.4989nM.